Bournemouth Borough Council: Pure Town Planning has just received an approval for the latest restaurant in Bournemouth town centre in the former Jones Bootmaker shop in Wessex House, Gervis Place. 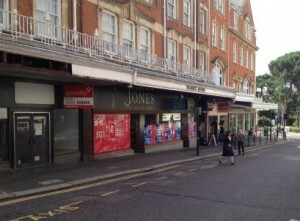 Despite objections from the neighbouring businesses and a tricky four storey extraction duct issue to deal with, Pure Town Planning efficiently obtained planning permission for the change of use from Bournemouth Borough Council which includes consent to open until midnight seven days a week. Fans of Jones Bootmaker will be pleased to know that they have relocated just round the corner to Old Christchurch Road. Are you marketing an empty commercial premises? Have you thought about a change of use to broaden the number of potential tenants? Call Pure Town Planning to find out what your options are.